A dramatic and modern table from Bonaldo. BIG table, with coloured legs and white top. A closer view of the angled legs on the BIG table, shown in colour finish. BIG table, close view of top and legs. BIG table, with black stained top and black legs. BIG table, 200cm and 220cm wide, dimensions. 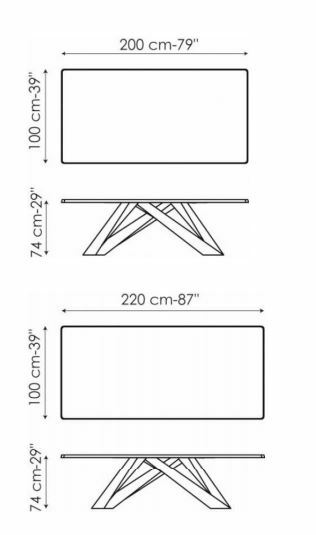 BIG table, 250cm and 300cm, dimensions. The Big Table has a distinctive steel base that can be as dramatic as you choose. With its laser cut steel base, where each piece has a different shape, the Big table is perfect for a modern kitchen, dining room or boardroom. The legs can be painted in a single colour, (white or grey) or in particular colour combinations for an even more creative presence. And with fixed or extending tops in a whole series of different options this really is a master of versatile design. If you cannot see the table you are interested in in the options above, then please contact us via email at purves@purves.co.uk or call 020 3397 3723 (Mon - Fri, 9am - 5pm) and we'll be happy to discuss the perfect table with you. Dimensions: The table is available in 4 sizes, or two extending versions. Delivery: Delivery and installation by our specialist team can be quoted for at the time of your order, but within the M25, we expect this will be between £95 and £120 depending on what has been ordered. Outside the M25, the price will increase depending on the distance from London.